Stackable Pizza Dough Box lets you save time, money and labour as it will prevent crusting, increase the storage life of your dough and reduce your need for frequent dough production. It is easy to clean and won’t bend, distort or sag. 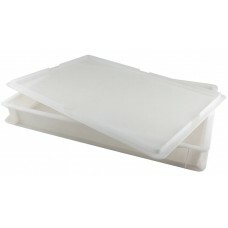 Lids are available but the bases stack into each other and act like a lid. There are two size's to choose from 60x40x7cm and 60x40x10cm high, we have other sizes in stock on request but these are the most popular, they are ideal for any Pizzaria, Restaurant or Takeaway.